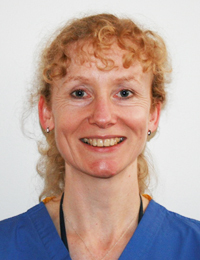 Dr Judith Jones qualified from The London Hospital Medical College Dental Institute in 1987. She returned in 1991 and completed a MSc in Experimental Oral Pathology, with a research project on integrins in oral epithelium. She was awarded an MRC Training Fellowship to further this work and gained a PhD in 1996. She completed ACCOMS training at GSTT & KCHT and was awarded a CCST in Academic Oral Surgery in 2003, followed by an Honorary Consultant in Oral Surgery at GSTT & KCHT appointment in 2005. She returned to QMUL/Barts Health NHS Trust in 2008 as Senior Clinical Lecturer/Honorary Consultant in Oral Surgery, and was promoted to Reader in 2013. She is the Lead for Assessment within the Institute of Dentistry and Lead for the Centre of Teaching and Innovation. Her major interests lie within education and assessment and she has extensive experience in this arena. She is the Academic Lead for the OSCE components of both ORE and LDS RCS, and the Training Programme Director for Oral Surgery and Chair of the STC for London and South East HEE. She is also an elected Board member of Faculty of Dental Surgery RCS England.